With the culmination of the 18.6-year cycle of the Moon in 2006 and again in 2024-25, also called the Major Lunar Standstill, we are afforded the unique opportunity to observe the monthly, annual, and 18.6-year wanderings of the Moon. The 18.6-year cycle is caused by the precession of the plane of the lunar orbit, while this orbit maintains a 5° tilt relative to the ecliptic. At the peak of this cycle, the Moon's declination swings from -28.8° to +28.8° each month. What this means is that each month for the years 2005-2007 and also 2023-2026, the Moon can be seen rising and setting more northerly and also more southerly than the solar extremes, and will transit monthly with altitudes which are higher in the sky than the summer Sun and lower in the sky than the winter Sun. The U.Mass. 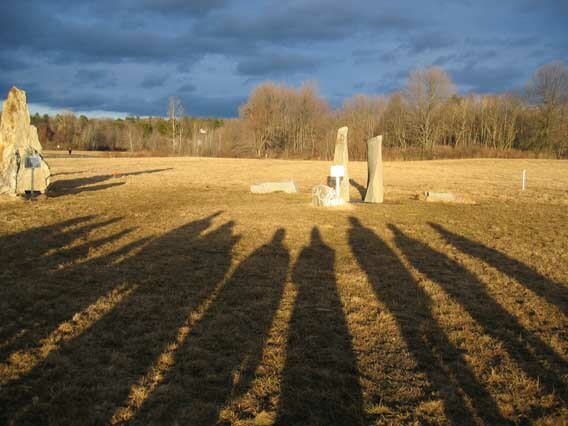 Sunwheel is a stone circle calendar which I created in 1997 on the campus of U.Mass. 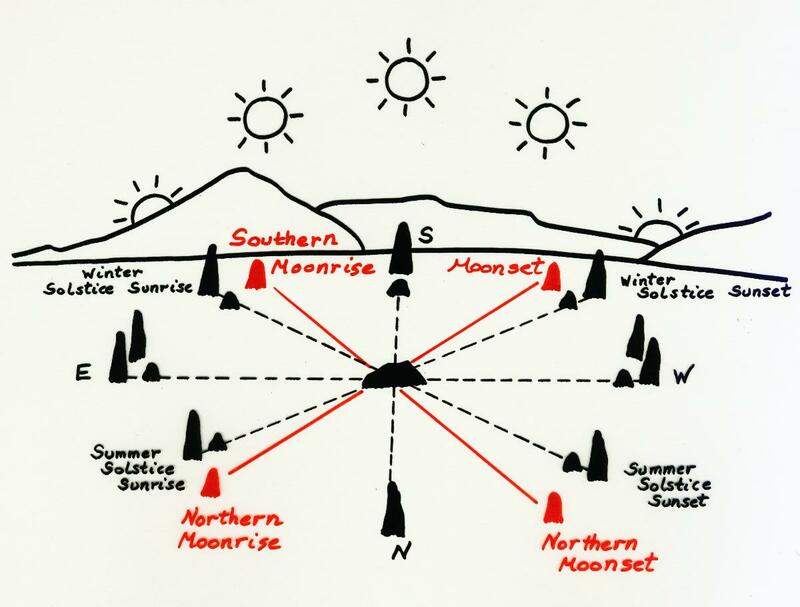 Amherst, with 8'-10' tall stones marking the cardinal directions, the solstice sunrise and sunset directions, and the northernmost and southernmost moonrise and moonset directions. Over 25,000 people have visited the Sunwheel since its construction, and over 10,000 have attended the seasonal sunrise and sunset gatherings which I host. The U.Mass. Sunwheel is one of the calendar sites around the world -- including Stonehenge, Callanish, and the "Sun Dagger" at Chaco Canyon -- where the 18.6-year cycle of the Moon is marked. The following material explains the monthly behavior of the Moon along with the 18.6-year lunar cycle, including why there is an 18.6-year cycle, and what the observable consequences of this cycle are. To understand the patterns in the movements of the Moon requires some familiarity with the somewhat simpler pattern in the movements of the Sun. From day to day, the Earth revolves, or orbits, around the Sun in a plane which we call the ECLIPTIC, completing one orbit around the Sun in a time we call the YEAR. At the same time that the Earth revolves around the Sun, our planet also rotates, or spins, around an imaginary axis running from the North pole to the South pole, and completes one rotation in a time we call a DAY. The Earth's equatorial plane does not coincide with the plane of the ecliptic, but rather there is a tilt of 23.5° between the two planes; this is equivalent to a tilt of 23.5° between the Earth's rotation axis and the direction which is perpendicular to the ecliptic. As Earth revolves around the Sun with a tilted axis of rotation, Earth's axis always points toward the same direction in space. We know this to be true because Polaris, the North Star, never appears to rise or set, and is always seen in the same place in the sky from hour to hour and night to night as viewed from a particular location. 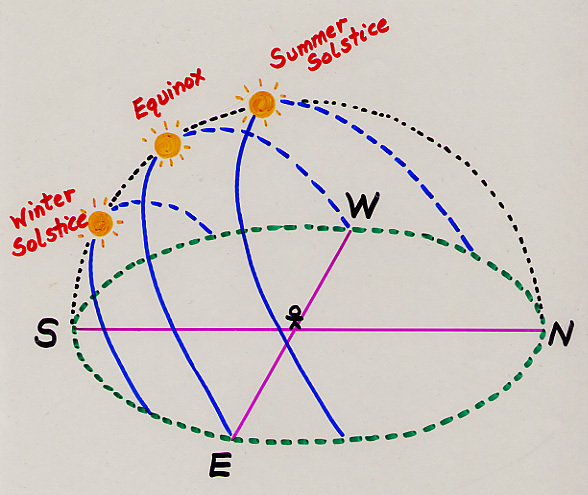 This is illustrated in the following figure, which shows the daily tracks of the Sun on the solstices and equinoxes, as seen by on observer at mid-northern latitudes. Like a pendulum, the sunrise direction changes from NE @ summer solstice to SE @ winter solstice, and back to NE, completing one full swing back and forth, or one full cycle, each year. Also like a pendulum, there is a stopping or 'standstill' at the extremes, or solstices. In fact, the word solstice means 'standstill of the Sun'. The Moon orbits, or revolves, around Earth and completes one revolution in 29.5 days. This is the same length of time that it takes the Moon to complete one cycle of phases. Because of the shorter period of revolution for the Moon around the Earth, compared to the revolution of the Earth around the Sun, the Moon completes between 12 and 13 cycles of lunar phases in 1 year. (1) The Moon completes one orbit around us in a much shorter time than 1 year (in 29.5 days or about a month, in fact, in contrast to our orbit around the Sun with a period of 365.25 days). (2) The plane of the Moon's orbit is close to the plane of Earth's orbit around the Sun, but not identical -- the Moon orbits us in a plane which is tilted by 5.1° relative to the ecliptic. THE MOON'S 18.6-YEAR CYCLE -- What and Why? The plane of the Moon's orbit is tilted at an angle of 5.1° to the plane of our orbit around the Sun. Due to the effects of the Sun's gravity, the Moon's orbital plane does not stay fixed in space, but "precesses" with an 18.6 year cycle, while still maintaining the 5.1° tilt relative to the ecliptic. This means that the most northerly and the most southerly rising and setting of the Moon occur every month at the peak of the 18.6 year cycle. The Moon's 18.6-year cycle peaks in 2006 and 2024-25 (and every 18.6 years thereafter), with observable consequences extending for at least 3 years around the peak year(s). THE 18.6-YEAR LUNAR CYCLE IS OBSERVED AS A MODULATION IN THE OUTER EXTREMES OF THE MOON'S MONTHLY RANGE OF RISING AND SETTING. The schematic diagram below shows the placement of the stones in the U.Mass. Sunwheel as seen from above, with large dots for the 8'-10' tall stones and the small dots for the 2'-4' tall stones. The Sunwheel includes stones for cardinal directions, solstices, and the northern and southern extremes of the lunar rising and setting seen at major standstill. The figure indicates the maximum monthly range of moonset and moonrise seen at major standstill, and the minimum monthly range of moonset and moonrise seen at minor standstill. WHY THE TERM 'STANDSTILL' ? The monthly range of lunar Declination changes very little from 2005-2007 and also from 2023-2026. Also during this time, the monthly range of moonrise and moonset directions changes little. The fact of little change in the outer extremes of monthly range of rising and setting directions for ~3 years is what leads to the use of the term STANDSTILL. Solstice means 'STANDSTILL OF THE SUN' and refers to the fact that the Sun's Declination changes little for the ~2 weeks around solstice. The sunrise and sunset directions change little over this time as well. THE SUN'S ANNUAL CYCLE IN CHANGING SUNRISE DIRECTION BEHAVES LIKE A PENDULUM. The sunrise direction changes rapidly from day to day near the Equinox, like the rapid motion of a pendulum at mid-swing, and there is a stopping or 'standstill' at solstice, like the outer limit of the swing of a pendulum. Over the 18.6-year cycle of the Moon, THE CHANGING MOONRISE AND MOONSET DIRECTION BEHAVES LIKE A COMPOUND PENDULUM SYSTEM. More time is spent monthly at the N and S extremes of moonrise and moonset than in the middle -- this behavior is described by the first pendulum. And, from month to month within the 18.6-year cycle, the Moon spends more time with the monthly range of rising and setting at the outer extremes (major standstill) and at the inner extremes (minor standstill) than at the middle extremes. It is as if the pendulum representing the monthly range of lunar rising and setting is modulated by 2 additional small coupled pendulums, one at the Sun's northern rising limit and one and the southern. When these 2 pendulums swing out we get MAJOR lunar standstill, and when they swing in we get MINOR lunar standstill. The fact that the Moon spends more time with the monthly range of rising and setting at the outer extremes (major standstill) and at the inner extremes (minor standstill) than at the middle extremes is the reason for the use of the term STANDSTILL. WHICH CALENDAR SITES AROUND THE WORLD MARK THE LUNAR STANDSTILL ? 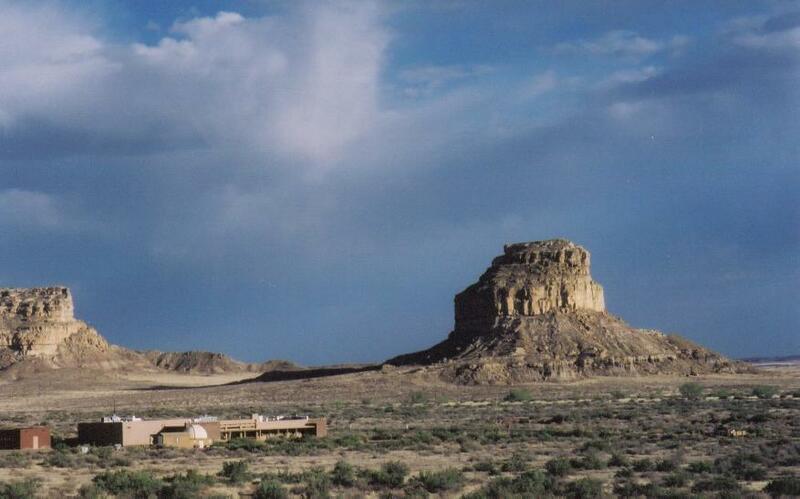 (3) CHACO CANYON, NEW MEXICO is a 1,000 year old solar and lunar calendar, located high (400') atop Fajada Butte, inaccessible except by ropes. 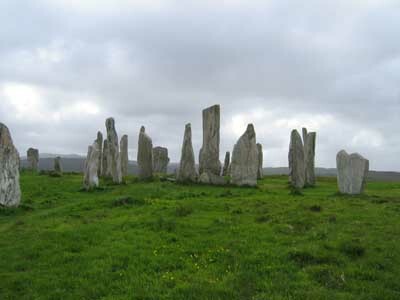 This site was discovered in 1977 by Anna Sofaer. At noon on the solstices and equinoxes, a dagger of light (called the 'Sun Dagger') pierces a spiral petroglyph carved into the rock face of the cliff. The same spiral petroglyph has been shown to also mark the major and minor standstills of the Moon. The Sun Dagger is accepted by archaeoastronomers worldwide as the best example of a culture keeping track of the Sun and also the 18.6 year cycle of the Moon. (4) THE U.MASS. 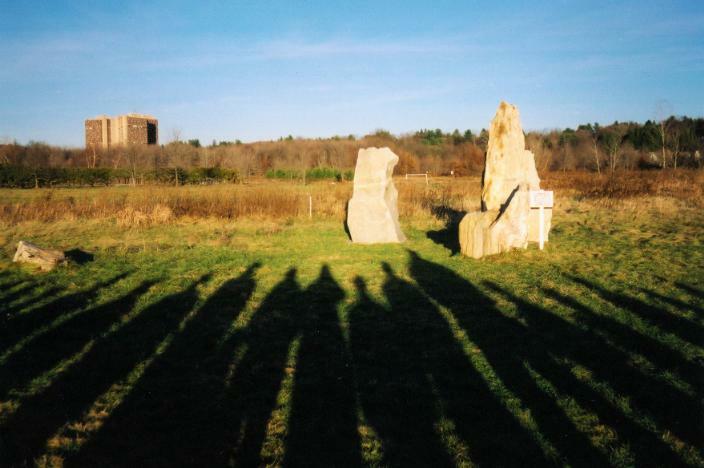 SUNWHEEL is an 8 year old stone circle -- a solar and lunar calendar and observatory located on the campus of the University of Massachusetts, Amherst. 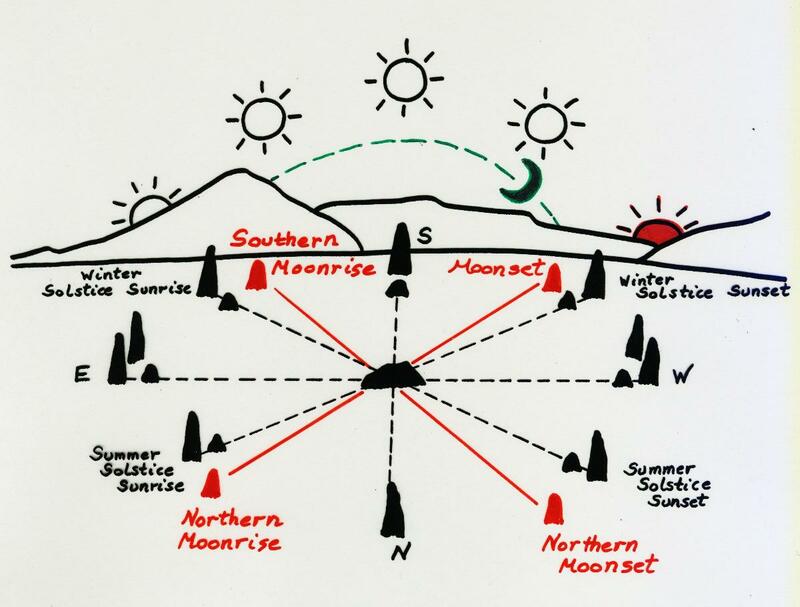 The stone circle contains 14 stones 8'-10' tall, marking the cardinal directions, the directions along the horizon to the rising and setting Sun at the solstices and equinoxes, and the directions to the rising and setting Moon at major lunar standstill. WHAT, SPECIFICALLY, COULD WE SEE DURING THE 3-YEAR PERIOD CENTERED ON A MAJOR LUNAR STANDSTILL YEAR? At MAJOR STANDSTILL, the Moon exhibits the maximum monthly range of rising and setting directions. The full Moon near winter solstice in 2005-07 rises and sets the farthest North that the Moon ever gets, and farther north than the Sun ever gets. At transit, the winter solstice full Moon will be higher in the sky than the summer Sun ever gets. DID YOU NOTICE THIS around Dec. 27, 2004? The full Moon near summer solstice in 2005-07 rises and sets the farthest South that the Moon ever gets, and farther south than the Sun ever gets. 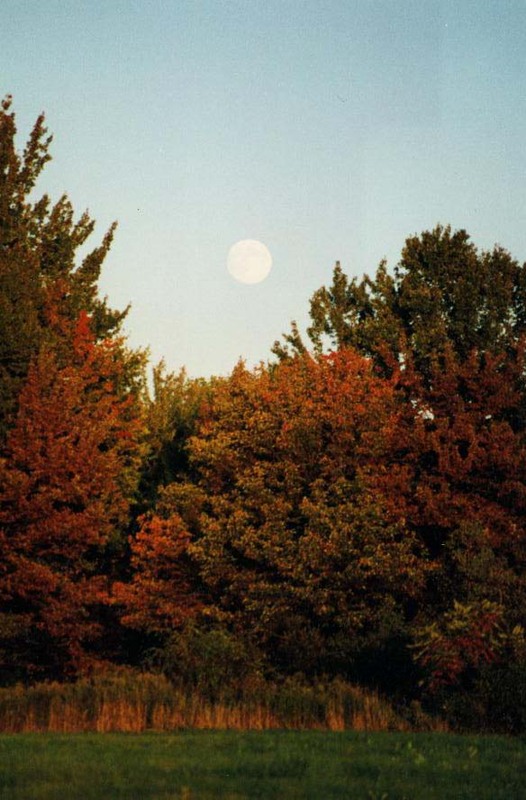 At transit, the summer solstice full Moon will be lower than the winter Sun ever gets. [To notice this requires knowing which way South is, since a low Moon can also be one which is just rising or setting.] 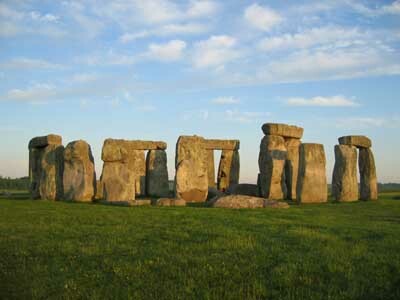 DID YOU SEE THIS at summer solstice 2005? The 1st and 3rd quarter Moons around equinox during 2005-2007 are at the northern and southern extremes of the Moon rising and setting. In particular, around the spring equinox in 2005, we had high Moon on March 18, and a low Moon 2 weeks later on April 1-2. The crescent Moon near winter solstice will be the southern rising and setting Moon (see diagram below). The crescent Moon near summer solstice will be the northern rising and setting Moon. BUILD A SUNWHEEL IN EVERY COMMUNITY!